Mixed sentiments were seen at two of the latest government land sales (GLS) tenders as one has garnered bids which are within the market’s expectation, while the other receive received lukewarm interest from property developers. The more popular site among the two was the mixed residential and commercial plot situated along Middle Road. The Middle Road GLS site drew a total of 10 bids, with the top bid coming from Wing Tai Holdings at almost $492 million ($1,458.33 psf ppr). It was same to be within expectations when it was first announced for sale back in December 2018. It was noted that the total number of bids garnered is the highest since the GLS tender for a site at Mattar Road in 2018 – which also received 10 bids. The top bid for the Middle Road GLS site is just 4.7 percent more than the runner-up bid from a joint-venture between MCC Land and Greatview Investment. Some other prominent developers involved in this land tender at Middle Road include a tie-up between City Developments Ltd (CDL) and MCL Land, GuocoLand, Cheung Kong Holdings, a joint-venture between UOL Group and UIC, and Far East Organization. Market watchers mentioned that due to the excellent location of the Middle Road site, it’s not surprising to see interests being received from the seasoned and more experienced property developers who are eager to developer their residential real estate portfolio within the Beach Road precinct. The Middle Road GLS site is situated within the city center and is surrounded by a wide range of prominent residential developments such as South Beach Residences and Duo Residences; shopping malls such as Suntec City Mall and Bugis Junction. Analysts believed that the site is set to benefit from the government’s future plans to introduce more housing supply within the Central Business District (CBD) under the latest draft Master Plan 2019. 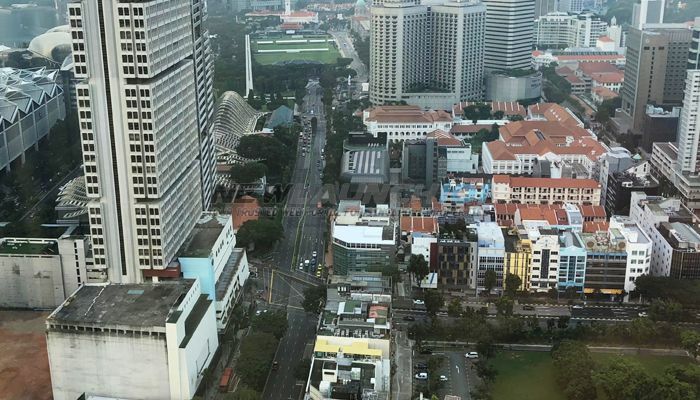 In addition, they also believe that the top bid for this Middle Road GLS site will be used as a significant benchmark for another plot at Tan Quee Lan Street. That plot has been deemed relatively more attractive to developers as it is sitting right above Bugis MRT station. Another site, which saw only 5 bids received, is located along Sims Drive – within the Geylang precinct. It drew a top bid of close to $383.53 million ($732.01 psf ppr) from a joint venture between Hong Leong Holdings and CDL. The property consultancy firm, Colliers International said that the top bid received for the Sims Drive GLS site was below market’s expectations. It is the lowest winning bid amount received for a private residential site since a relatively small site along Chong Kuo Road was sold $681 psf ppr back in the first half of 2018 – before the latest property curbs took effect in July 2018. GuocoLand, who developed Sims Urban Oasis condo (situated just next to the Sims Drive GLS site) was also involved in this land tender – coming in second place with a bid of around $655 psf ppr. It was noted that Sims Urban Oasis has already been fully sold since it was launched back in March 2015. When being asked about the disparity between these 2 subject sites, analysts believe that other than their clear differences in terms of location, it is partly due to the fact that the site at Sims Drive is located outside the Central Area – which means the developer will be subjected to government’s ruling of having to build an average unit size of 85 square meters within the future new launch condo project. On top of that, the Sims Drive GLS site is surrounded mainly by HDB flats, industrial properties and it is also situated right next to the Pan-Island Expressway (PIE) – which may be a turn-off for prospects who are looking for exclusivity and privacy. The site is also located slightly off where the closest Aljunied MRT station is.